Syrian Deputy Prime Minister and Foreign Minister Walid Al-Moualem, who was visiting New Delhi to urgently “revive” economic relations with India, said Russia’s “intervention from the air” has helped the Syrian armed forces regain 20% of the territory lost to ISIS and given Syrians cause for hope. India is not a player in the West Asian crisis, although it has traditionally had very good relations with most of the parties involved, including Syria. But it has faced terrorist attacks for over two decades and, when Syrian Deputy Prime Minister Walid al-Moualem came calling on the Indian leadership and offered “security and intelligence cooperation,” the Indian government was happy to accept. According to sources, Syria has offered India “priority ranking” to come in after the hostilities are over and help in the reconstruction and rebuilding of the war-shattered country. 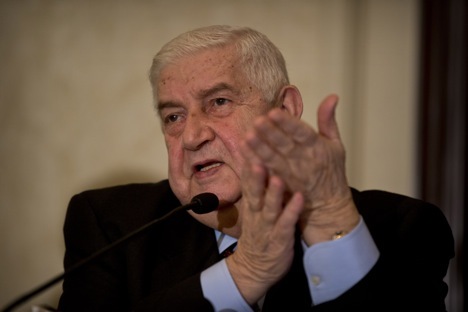 Asked how Russian aerial intervention in Syria had affected the conflict, al-Moualem was thankful and appeared optimistic that the end to the conflict was possibly in sight. “We are closely coordinating with the Russian Air Force and, with their help, we have recovered 20% of lands from the terrorists,” he said. “Going by the experience of these three months, Russia stands to achieve 10 times more than the US did in 18 months,” the Minister said. “Syrian-Russian cooperation has succeeded in good measure,” the visiting Syrian minister said. “It is not only against terrorism for us, but also self-defence for the Russians. Thousands of Chechens are fighting in Syria with ‘Daesh,’” he said, using the Arabic acronym for the Islamic State while referring to ISIS. Scathing in his remarks against Turkey and Saudi Arabia, Al-Moualem said, “if Turkey, Saudi and Qatar stop interfering and helping the terrorists, then 70% of the problem will be ended,” and the hostilities can be brought to an end. Speaking of the Syrian Democratic Forces (SDF), which were in the forefront of the anti-ISIS operations, both Russia and the United States, al-Moualem said, were now supporting the SDF, mostly made up of members of Arab tribes, Kurds, Syrians and Christians, against ‘Daesh’.